Hybrid Masks combine the comfort of a nasal pillows mask with the utility of an oral mask. This dual interface provides continuous positive airway pressure (CPAP) for sleep apnea patients. The design removes pressure points from the bridge of the nose and from the forehead. Although it has the same function as a full face mask in delivering pressurized air to the nose and mouth, the hybrid mask has fewer pressure points to irritate patients. This type of mask is ideal for people who commonly breathe through their nose when sleeping but occasionally have congestion which then requires mouth breathing. The hybrid mask along with a CPAP system is used to treat sleep apnea. CPAP treatment keeps the airways open throughout the night to help prevent snoring, hypertension, memory loss, diabetes, depression and other disorders. 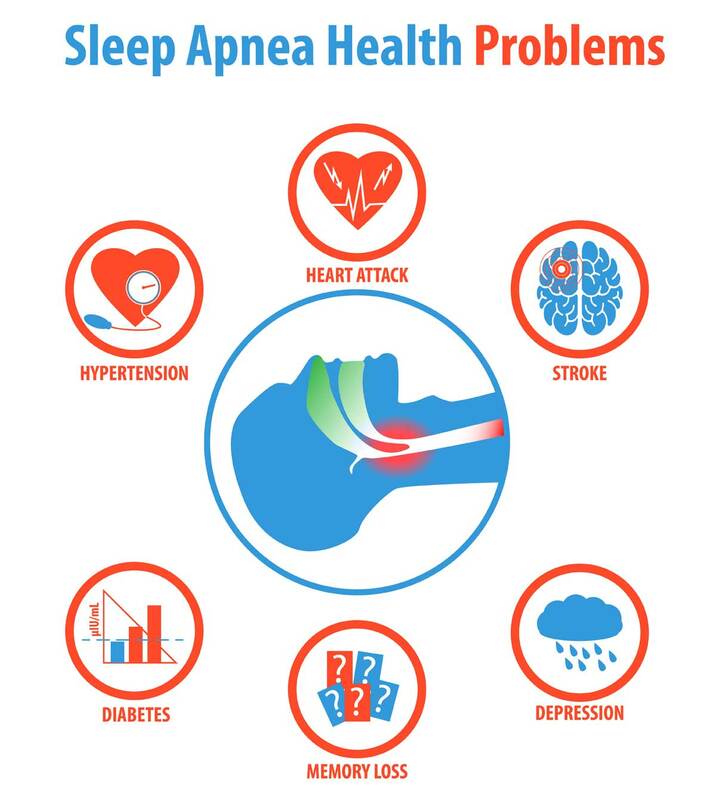 The graphic below depicts several of the illnesses that can result from untreated sleep apnea. The images above profile the same hybrid full face CPAP mask with nasal pillows and headgear at different angles. The mask above is the ResMed Mirage Liberty. It offers a soft nasal pillows interface and a soft cushion around the mouth for a comfortable fit. The fact that there is no contact with the forehead or nose bridge is a common factor with all hybrid masks. The headgear keeps this mask firmly in place against the nose and mouth. Hybrid masks are all very similar in design. In the image above are two hybrid masks that display minor differences. The mask on the left has a smaller profile against the user's face. It also employs a soft nasal cushion interface. The mask on the right has a slightly larger and more "boxy" profile against the user's face. It also has a nasal pillows interface instead of a nasal cushion. Both designs deliver nasal and oral pressurized air for sleep apnea therapy. Currently there are only a few options of hybrid masks on the market for sale. Some manufacturers refer to their hybrid mask as a full face mask since it performs both nasal and oral therapy. Pictured above are three "hybrid" masks. The one on the left, highlighted in pink, employs a smaller mask frame and a nasal cushion interface. The headgear attaches to this mask at four separate points to provide a good fit and seal against the CPAP patient's face and nostrils. The two masks to the right highlighted in yellow are slightly larger and also have four attachment points for the headgear. These two mask also utilize a nasal pillows interface. The exhalation ports differ somewhat on these masks. The one DeVilbiss version has the exhalation ports above the swivel connector. The Mirage Liberty has the ports on both of the front of the mask. The headgear on each of these masks is extensive, similar to full face masks without forehead support. Each mask comes with a swivel hose connector located on the front of the mask. Pressurized air is provided to both the nose and mouth simultaneously on each mask. Patients may alternate at will between nasal breathing and oral breathing throughout the night. There are four key components to each of the hybrid mask designs. The image above displays these four components on the ResMed AirFit F30 Mask. 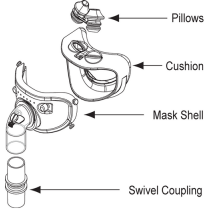 These components are the headgear, mask cushion/nasal pillows, mask frame, and swivel connector. The mask interface attaches to the mask frame. The headgear secures the mask frame and cushion against the patient’s face to achieve a good seal. The swivel connector also attaches to the mask frame at the front of the mask. 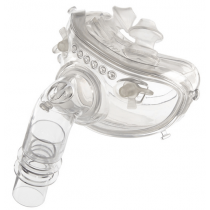 All four components work in unison as the final path from the CPAP Machine to the Air Supply Tubing to the mask assembly to deliver pressurized air to the patient. Choose this mask if nose breathing and intermittent mouth breathing is your sleeping pattern. This mask design supports patients with ocassional congestion or some other nasal obstruction. It also supports patients that switch between nose and mouth breathing throughout their sleep. The reduced frame size is less intrusive. It does not touch the sensitive forehead or nose bridge areas. For many patients, the hybrid mask is their best full face mask option. Patients that prefer a standard nasal interface over nasal pillows may want to select the AirFit 30 Mask. See the handy selection guides at Types of CPAP Masks and CPAP Mask Selection Aid for additional help in choosing the best CPAP mask for you. Below is a list of the top CPAP Hybrid manufacturers. What is a Hybrid Mask? It is a CPAP mask for sleep apnea that provides pressurized air to the nose and mouth. Do I need a Hybid CPAP Mask? If you need a full face mask due to congestion or habitually breathe through your mouth while sleeping and are sensitive to forehead or nose bridge pressure, you are a prime candidate for a hybrid mask. How does a CPAP Hybrid Mask Work? Like other CPAP masks, the hybrid works in conjunction with an air supply hose and a CPAP machine. The mask directs pressurized air to the mouth and nose simultaneously. The patient can breathe through their nose or mouth interchangeably throughout the night. What is the Most Comfortable CPAP Hybrid Mask? Most CPAP patients find that the smallest profile mask is the most comfortable. Currently the smallest profile hyrid mask is the ResMed AirFit F30. The most searched on the Internet and best selling hybrid mask is the Dreamwear Full Face Mask. This mask offers minimal contact with the patient's face, magnetic clips to secure the headgear, a soft silicone in-frame airflow with top-of-head air hose connection. The second most searched hybrid mask is the ResMed Mirage Liberty. De Vries, G. E., et al. "Continuous positive airway pressure and oral appliance hybrid therapy in obstructive sleep apnea: patient comfort, compliance, and preference: a pilot study." Journal of Dental Sleep Medicine 3.1 (2016): 6. Chandran, Sanjay, Shara Hernandez, and Louis Javier Collazo. "Hybrid ventilation mask with nasal interface and method for configuring such a mask." U.S. Patent No. 8,042,539. 25 Oct. 2011.